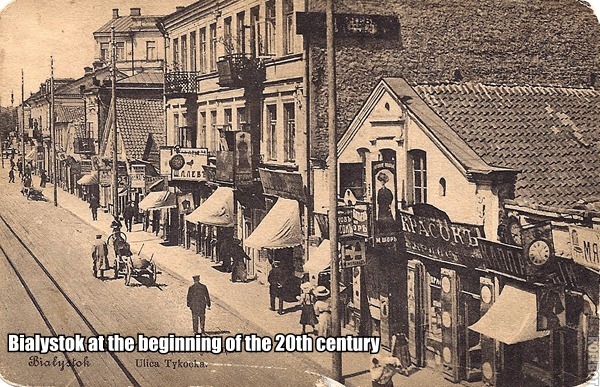 At the turn of the 20th century Białystok, an industrial city with a population of 80,000 in the Polish part of the Russian empire, was the scene of one of the earliest examples of a mass working class movement inspired by anarchist principles. 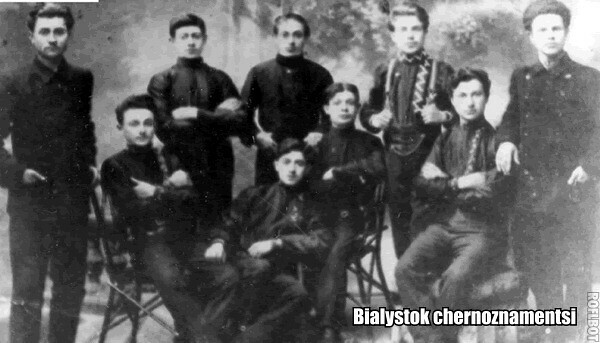 The ideological impetus for the revolutionary movement in Białystok in 1903–1906 was supplied by Chernoye Znamya [Black Banner], an organization which drew on classical anarchist doctrines but also developed its own approach to building a revolutionary working class movement. In this article, a leading participant of the movement, Iuda Solomovich Grossman-Roshchin, reminisces about Białystok Black Banner and the place it occupies in the history of proletarian revolution. By 1924, when this article was published, Grossman-Roshchin had renounced many of his earlier views but his nostalgia for the period of the 1905 Russian Revolution is apparent. Grossman (Roshchin) ... debated with the Bundists and Socialist Revolutionists. Nobody could beat him in debate, and he confirmed me in my anarchist faith. He walked the streets of Białystok with his pockets full of leaflets and papers, absently-mindedly reading some revolutionary brochure. I met him later in Moscow, in 1918, well-dressed in a suit and with a well-groomed beard, a totally different man... Yuda himself never took part in “ex’s” or other militant activities. His specialty was speaking and debating, in which he was an undefeated champion. Bergson said somewhere: joy is the striving for the future, grief is the return to the past. I don’t think this is true. Often in history we see classes and individuals who are blocked from a path to the future gladly turning to the past, trying to relive that past in their imaginations. On the other hand, those to whom the way to the future is illuminated with bright and inextinguishable lights turn to the past without grief. The joy in such a return to past is explained by the almost irresistible urge to grasp the internal wholeness and unity of the historical process and one’s own, even though small and modest, part in it. I assume this at least partially explains the abundance of memoir literature in recent times. A definite phase in the history of proletarian struggle has ended. Battles from new positions are ongoing. An awareness of the tasks of the moment does not obscure, but rather illuminates, the contours of historical continuity. Let the Spenglers proclaim that there is no continuity to history, that the chord dies away never to be heard again by the most sensitive ear. Let them. But we know that even with the existence of new social classes and the vigorous opposition of one class ideology to another, the threads of history are not being broken but rather we are gaining a deeper understanding of the significance and distinctive character of our links with the past. Mind you only an historian, equipped with a correct method and really in tune with the fundamental problems of the present, can give a proper schematic of the relations between opposing classes of different eras. But the historian needs help from memoirs and recollections. In “Thoughts about the Past”1 I have no intention of giving any sort of coherent account of the anarchist movement. Just memories, fragments, descriptions – the jottings you might find in a notebook. But even within this framework I must limit myself even more. I will speak only about one faction or tendency in Russian anarchism – Black Banner [Chernoye Znamya]. And not just because I worked in this movement and was to some extent its ideological spokesperson, but also because an account of the anarchist movement in general would require materials which are not at my disposal. It’s true that Black Banner was particularly deficient when it came to documents. Our opponents were completely justified in reproaching us, the chernoznamentsi, as presenting a babble of different voices, and for the fact that our theoretical positions were never firmly established. This is true. You won’t find a single comprehensive article about “motiveless terror”, the critique of democracy, the critique of Kropotkinism, or our position on unemployment. We had almost no literature of any kind. We published one issue of Chernoye Znamya, one number of Buntar [The Rebel], two or three issues of “The Young Rebel” (Comrade Erdelevsky’s group), and countless proclamations. But I don’t have a single proclamation with me now. And the newspaper issues mentioned give only a weak and approximate notion of the positions of Black Banner. But here I can draw on personal experience. It would seem appropriate for me to present now an outline of the theoretical premises of the group. But I shall do this another time, in a full-fledged article appearing soon. Certainly this is of historical interest, but not just historical. The fact is that Black Banner was distinguished for carrying on ideological and tactical struggles on two fronts. With social-democratism, since the social-democratism of the Second International both openly and secretly covered its nationalist tactics and ideology with class phraseology. And with Kropotkinism, since along with insurgency and maximalism it actually endorses carefully camouflaged petty-bourgeois federalism and minimalism. The struggle with democratism was the soul of the Black Banner movement. And in no way was this a repetition of the struggle of the old anarchism with democratism. Our struggle was motivated strictly by class considerations, in contrast to the old anarchism. Nowadays, in light of the October Revolution, it has become clear that differentiation on the issue of casting off the yoke of democratism did not take place only in the ranks of the old social-democracy. This struggle also occurred in the ranks of the Russian anarchists. And the ideological and tactical expression of this struggle was the Black Banner movement. It’s true that in the Bolshevik milieu this process seemed to take place rather slowly; the divide between Lenin and Kautsky in 1905 was scarcely noticeable. But this unhurried tempo is explained by the strong links with the vanguard of the workers’ movement, which slowly but surely, not only in its thinking but also in its organizational forms, liberated itself from its obsession with democratism. Not all the anarchists were opposed to “democratism”, for Kropotkinism was in fact seriously contaminated with a peculiar, pre-capitalist democratism in the form of liberal-federalism. This defect came to the fore in war-time. The chernoznamentsi exposed this defect from the very beginning of their movement. I recall one interesting episode. When I arrived at Makhno’s headquarters in 1919, I straight away read a report to the senior staff about why, as a former chernoznamets, I was working hand in hand with the Bolsheviks. I explained that in essence the chernoznamentsi were engaged in the same kind of work as the Bolsheviks, and that these two parallel lines of action, despite the theorems of geometry, were destined to come together at some point in the expanse of history. Arshinov, that same Arshinov who finally moved on to Makhno and who now stands at the head of a slanderous campaign of persecution directed against me for selling out to the Bolsheviks, expressed doubts about the historical correctness of my analogy. However he subsequently agreed with me totally. This episode shows that the study of Black Banner is by no means of historical interest only. “Thus our tasks and slogans at the contemporary moment are as follows: among the peasantry, the slogan – land and agricultural implements. In the army – refusal of military service, appeal to mutinies and support for the people in their struggle. In this way we will expose the halfway nature of the appeal for ‘bourgeois revolution’. Secondly: the successful application of economic terror – as the main and indispensable means of building up revolutionary traditions, and of digging an impassably deep abyss between proletariat and bourgeoisie. Our work among the reserve army will increase the number of enemies of society, enemies with whom democracy will not be able to come to terms. By doing all this we shall paralyze the attempts of democracy to crush the spirit of the labour movement – the spirit of revolt. We will be placing dynamite under the bourgeois train." “The revolution will come – with examples of heroic fighters, with the blood of fallen victims, and with the crosses of common graves. And over the course of many, long years the democratic banner will become sanctified in the eyes of the masses. For them this banner will become precious, representing something achieved through much suffering. The masses will then greet any criticism of democracy with coldness and hostility. Such criticism will seem blasphemous and sacrilegious. That’s why it’s necessary right now to create one contrary, antithetical spot in the huge picture which represents democracy. Just one spot. It will flare up and then be extinguished. But it will leave a trace. The multi-million masses will notice and it will be imprinted in their minds as something which was at odds with the ideas and slogans of democracy”. “... And slaves, to their own misfortune, so often worshipped their masters, in the same manner as people worshipped nature in earlier times, with this difference -– that the ruling class in all epochs consciously tried and is trying to indoctrinate slaves with an attitude of religious respect for itself. “The slaves listened, bowed down, and sank even more into servitude. And when it was impossible to endure more hunger and humiliation, and when with reckless abandon the slaves hurled themselves at their enemies, the ruling classes said to themselves: we must subdue them by drawing them into our temple, by convincing them that here is their saviour, their god; we shall create for them the illusion of one nation, covering over opposing class interests – a sort of lightning rod for private property and the state. This long-winded preface was necessary to me in order to provide the reader with an orientation and means of making sense of my subsequent narrative. I want to tell the story of but one page in the illustrious history of Bialystok, at a time when the anarchists had concentrated significant forces there. The attentions of both the revolution and the reaction were simultaneously focused on this one spot. Once more I must emphasize: I’m offering only vignettes, moments, sketches. And nothing more. Anarchist activity in Białystok began around 1903. No one disputes that the Bielostok group was connected with the broad masses of the proletariat in the closest manner. One might expect that the application of economic terror would make it possible for a handful of revolutionaries to transform themselves into some kind of saviours “from outside”. However, this economic terror in fact helped in forging closer links with the masses. It must be noted that in general this economic terror, at least in its later stages, was applied with great forethought. Terrorists acted only at the moment when extra pressure was needed or when it was necessary to eliminate the most fanatical entrepreneurs, engaged in organizing the resistance of their class. In such cases the members of the federation3 who took action were closely linked with the masses. On many occasions the group rendered assistance of a purely technical nature. Strikes were almost always won. Wide-scale mass agitation was carried on among the workers, and to some extent among soldiers. The propaganda was at a rather high level for those times. There were close links with student groups. The movement even included the most backward layer of workers – the “nityarkas” [female textile workers]. That our movement was huge – this the social-democrats of that time did not deny. The Bund4 published an especially thick issue devoted almost entirely to the critique of anarchism. In the articles and proclamations of the Bund it was acknowledged that the first anarchist group organized in Russia had solid, deep links with the broad masses. Within the Bund’s branches and at its meetings the main goal discussed was – the struggle with the anarchists. But our movement was not just restricted to Białystok. Groups sprang up like mushrooms after a rain in cities, villages, and hamlets. Białystok was the organizational centre, the heart of the whole movement. The groups preserved complete autonomy, but delegates were always turning up for directives of an ideological and tactical character. Attempts were made to bring about unity of methods and slogans. The countryside responded. Białystok was in a state of ferment. Soon rumours about Białystok anarchism penetrated throughout the whole of revolutionary Russia. Visiting representatives of other parties heard complaints from their local organizations that democratic slogans were not enjoying success among the Białystok proletariat, and there was a real danger that the anarchists would take over the whole region. Uninterrupted terror against the police resulted in their complete disorganization. It reached the point where the police were not able to show themselves in working class neighbourhoods, especially where the anarchists had their “headquarters”. Typically, even during the terrible, brutal Jewish pogrom in Białystok the police and even the army did not dare appear on Surazhskaya Street, the anarchist quarter. It’s worth saying a few words about the structure of the organization. At its head stood “the group”, which embodied the spirit of the whole movement. It was overwhelmingly made up of workers. This group was divided into sections. There were technical, agitational, and propaganda sections, and even “weaponry” and financial sections. The group was directly connected with federations – of textile workers and other types of workers. These federations took the form of non-partisan syndicates. The federations themselves were already mass organizations with typically 300 members. However the task of a federation was connecting with workers in a given branch of industry. The federations were organized according to anarchist principles. Beyond were the broad masses, who sympathized with us and continually entered the ranks of both the federations and the groups. Meetings were held either at the federation level or else all federations would call a huge meeting of all the workers. Meetings were going on all the time. I myself conducted literally hundreds of meetings under the open sky. The thirst of the labouring masses was unquenchable. It’s noteworthy that even discussions of theoretical problems such as the concept of the tempo of development, or the role of objective and subjective moments, drew in the broad masses. They listened avidly, seriously, almost solemnly. Soon the group also became a centre for the little problems of working people, but in a distinctive way: if someone was badly treated, if a teacher was abusive to children, if a landlord threatened to evict a tenant behind in the rent, if someone wanted to repossess a Singer [sewing machine] from a poor person who had missed a payment – all these problems ended up with the “Bialystok group”. We had to throw together something like an arbitration board to sort out stuff which in one sense was trifling but in fact was making life miserable for the poor. It was impressive to see how unquestioningly both sides behaved when the group pronounced its opinion (the group did not pass judgment, only expressed its opinion). I recall two amusing incidents: after a meeting, I, in a state of exhaustion, was heading towards the cemetery – the residence of the Bialystok anarchists. An elderly woman stopped me. She said that she had been at the meeting and completely agreed with me. “But,” she added, “can you persuade Motka the tinsmith to pay me the six rubles he owes me for lunch; I’m a poor woman and I agree with you about everything.” And another time, I was travelling by train from Lomza. I had an uneasy feeling that I was being followed. I couldn’t make up my mind: should I jump off the train or wait for the next station? Suddenly someone touched me on the shoulder. I was facing a small, red-haired man; I couldn’t see his face except for his feverishly glinting eyes. He asked me to come out on the platform between cars. It seemed that he had sold someone a batch of “remnants” – leftover fabrics. Then after the goods were delivered the customer “put the squeeze on him” [cheated him]. And now, “Can’t the defender of the poor – the Białystok group – help me get even with this blood-sucking capitalist?” If you consider the fact that petitioners from the villages began to approach the group, you will get a rough idea of the work which was carried out in Białystok. At the beginning of 1905 we won a strike in brilliant fashion, a strike which involved the most backward, down-trodden section of the proletariat – the women textile workers (nityarkas). The ethnic background of these workers was Polish. They were manipulated by the “populists” [narodovtsi]5. The chauvinism was unbelievable. The populists incited national hatred, introducing the snake pit of Polish nationalism. With subtlety and skill, even virtuosity, they employed revolutionary phrases for religious-patriotic goals. With a huge effort we succeeded in drawing these masses into a large-scale, all-out strike. Personally I attached colossal significance to the winning of this strike. We threw ourselves feverishly into supporting the strike. We had to overcome and keep overcoming the incredible obtuseness and diabolical opposition of the “populists”. But the greed of the owners, the shamelessness of their exploitation, as well as the whole revolutionary situation, played into our hands. And our work was excellent! It was an enormous victory when the women workers en masse came to the Suraz cemetery, demanding that a lecture immediately be read to them about class struggle. They swore not to give in and not to go back to work no matter what. Our enemies were cognizant of the importance of this change of course in the consciousness of the workers. Bishop Baron Ropp6, member of the State Duma, didn’t mince words when he slandered the strike from the pulpit, suggesting it was some kind of Black Mass replete with orgies. In due course I wrote a response to the esteemed prelate published in the pages of the Vilenskiy Severozapadniy Krai [Vilna Northwest Territory]7. As a matter of fact the behaviour of everyone involved in the strike was quite dignified, I would even say ascetic. Soon a new strike flared up which was almost general in scope, directed by the anarchist group. This strike was lost, which undoubtedly began the unraveling of the Białystok anarchist movement. The bourgeoisie and the political parties hostile to us were in unanimous agreement that winning the strike would result in a dictatorship of the anarchists in Białystok, and not only in Białystok. I won’t say anything here about the behaviour of the social-democrats at this key moment – I’ll get around to them when I have the documents at hand. For now I’ll just note that this was an incredibly intense struggle. Our opponents brought tenacity and energy to the struggle. I haven’t the slightest doubt that the loss of this strike was not the result of some chance error or the excessive demands of the workers. No. You have to look deeper. From one point of view it was here that the tactical and ideological immaturity of the whole movement was exposed. In intuitive fashion the right way to struggle against democratism was discovered. But a large-scale plan, a solid worldview, the ability to sense the pulse of the revolution – these were lacking. Generally speaking, there was a peculiar mixture of proletarian realism with utopian romanticism. This must be said straight out, without flinching. But here the weakness of the socialist movement as a whole was exposed beyond all doubt. Really. If you analyze the essence of the defeat of 1905, to the extent that this defeat depended on behaviour of our group, one must say the following: we were not democrats enough to form a united, national front with the bourgeoisie, and we were not class warriors enough to put forward purely proletarian demands for social revolution. We were too maximmalist in the eyes of the bankers of Western Europe, and too minimalist to bring about a fusion of the Russian and global proletarian on the basis of a proletarian program. By saying this I’m not blaming anyone nor am I suggesting that one must follow some abstract, consistent program. This intermediate position occupied by our group was dictated by the objective situation; the revolution of 1905 must be regarded as a great vanguard action to the battle which, after a decade-long interruption, was renewed and resulted in final victory in October 1917. We have already seen that the struggle with democratism was conducted by the chernoznamentsi not according to the tenets of the old anarchism of the Kropotkin type, but in vigorous battle against both social-democratism and Kropotkinism, in which we exposed petty-bourgeois, utopian federalism. I recall the first time I engaged in debate in Geneva against Yu. O. Martov, making use of chernoznamentsi arguments against unifying the tactics of democracy and class. I was approached by Vera Ivanovna Zasulich8, who said: “Your position is very different than that of anarchists of the old persuasion; you have a class analysis. Your views are mistaken, but they are mistaken in a different way.” The struggle in Bialystok was a success in the sense that it exposed the internal logic of the inevitable apostasy of the Second International. But in the transition to practice the organizational, tactical, strategical, and ideological backwardness of the movement became evident. A “breakdown” developed. Both a breakdown in the movement and a breakdown in individual workers. A period of demobilization of the anarchist ranks set in; at the same time the reaction began to mobilize, ending in the Bialystok pogrom. This moment of breakdown had great, and not only historical, significance. To the description of this moment I will now turn. ... Bialystok. The Suraz cemetery. Early morning. Today is a free day. No meetings. No assemblies. Only in the evening – the theoretical group. I came to the cemetery early. No one there. Just the sound of high-pitched, broken sobbing from somewhere. It was a woman who was crying at a grave. Gradually the members of the group show up. Outwardly everyone seems happy. But I know that a deep and irreparable crisis is upon us. Now Mitya appears with the famous terrorist Aron Elin. Aron Elin was an almost legendary character. After his death – he was killed by soldiers who stormed the cemetery – the official mouthpiece of the autocracy Warsaw Diary wrote that a huge combat unit had been wiped out. Aron Elin alone returned the fire of the soldiers and put to flight a Cossack patrol. He carried out terrorist acts against the bourgeoisie and the police with remarkable composure. You couldn’t really say he was “brave”. Apparently Socrates said that there is a type of bravery which is based on foolishness – on ignorance and a failure to gauge the forces and degrees of danger. Aron Elin accurately weighed all the dangers; more precisely he assumed in advance that the enemy was infinitely stronger. In him there was not the slightest trace of posturing or adventurism. He was quiet, straightforward, and lucid. He knew what he had to do and he did it. He never lapsed into “mechanical militancy” where a person automatically commits terrorist acts under the impulse of performing terroristic “art for art’s sake”. Elin was wired to the masses and he fulfilled a definite function. Nor did he have a trace of the psychology of making a “business of blood”, as Ropshin said of himself9, and not the slightest trace of self-admiration nor any predilection for exotic psychological quirks of a mystical-religous nature. He was authentic and forthright. With him was Mitya. Mitya could have written a wonderful poem about struggle and danger based on his own life. Mitya knew only the joys of feverish, intensive struggle. Mitya acknowledged only one enemy – tranquility, monotony, banality. Pale, as if exhausted by fever, he had an unquenchable thirst for action and viewed the group with suspicion, fearing that it would succumb to moderate, gradual methods. I recall a conversation with him. Mitya was exhausted, sick. He could not accommodate himself to a tempo of revolutionary development which was too slow for him. In desperation he said to me: “Why are they so patient? What are they waiting for? What a pity... Are they too well fed?... Not the workers. And yet they wait! Damn it all!” It was a waste of time trying to explain to Mitya the objective course of things, the logical development of the movement! Mitya “hated history”... It was his tragedy that he realized intellectually that there could be no victories without the millions, nor would there be. And now another arrived – Samuel. A worker. He read a lot. And now he was lying under a tree and deconstructing Sombart. He would read a bit and then grab his head and start chuckling: he had caught Sombart, the bourgeois ideologist, “falsifying science on behalf of the bourgeoisie”. Samuel considered himself a pragmatist. he worked in a syndicate, in a factory. But his pragmatism was an illusion. Samuel had a faulty perception of real life. He had a vision of other worlds; the world of the bourgeoisie was for him the devil’s realm, a sort of pale, distorted version of a different world. He, as a “materialist”, always spoke about real practice, but in fact he was an ethical romantic who approached the real world as a source of illustrations of the sinfulness and worthlessness of a regime of servitude. The group had assembled. Aron Elin approached me, accompanied by his “adjutant” with whom he had just been whispering. This adjutant was at the time not part of our group. He was a sullen, nasty, spiteful person. He had a cunning face and a cynical, malicious smile. If, in the organism, there are phagocytes which rush to restore damaged tissue, then this adjutant was like an active bacillus: he sensed where a rift was starting, where there were the first traces of demoralization, and he tried to rub salt in the wounds. I recall that 14 years later I was at the front at Makhno’s headquarters. I, Batko Makhno, and some of our associates were at a get-together in Berdyansk, I believe. I retired to a third class carriage so I could gather my thoughts and come to some conclusions. But I sensed that someone was staring at me. I raised my head: on the top berth was the “adjutant” – the same cunning eyes, the same cynical, vacuous smile. First the poison of skepticism, then the introduction of bacilli – like a virtuoso he sensed where there was decay and demoralization and rushed to render his “help”. Of course this breakdown was brought about by objective causes – by a contradiction which was exposed in the heart of the movement. The last failed strike in no way stifled the revolutionary enthusiasm of the masses. But it revealed a discrepancy between our destructive activities and the creative possibilities. We reached the point when our concrete demands to the owners ceased to make sense; everyone realized that we could defeat the capitalists, and that we had to take over the city, organize production, and set up an industrial-military commune. Just the day before I had visited a meeting of workers in a factory yard. The owner had closed the factory. The workers were locked out and were faced with the question of whether to start the factory running again. What were the chances of such a revolutionary commune? By no means was it the case that our group was so naive as to assume that it was possible to organize a commune that could exist on a long term basis on a small scale in a single territory. But it was assumed that such a commune would drawn on the enthusiasm and support of all the workers and serve as a radiant organizational and agitational stimulus. It was assumed that the revolution would be a lengthy process, and that in the subsequent advancing struggle this discrepancy between concrete demands and conscious possibilities would manifest itself throughout the whole of Russia, and that the transition to expropriation and organizing the tools of production, if not absolutely inevitable, was at least within the realm of possibility. Concretely there was a basis to suppose that links with the countryside would be established and that the peasants would supply food. It was necessary to act. We either had to curtail the progressive development of the movement and disperse our militants to other cities, or we had to issue a new organizational slogans – ones that were ideological but practical. It was assumed Białystok should not be abandoned without a final class struggle – to do otherwise would be capitulating when faced by a task of a higher than normal degree of complexity. Within our group, this broad problem was posed in a serious, comprehensive fashion. Everyone understood that our new task required diligent, concentrated, and comparatively protracted preparation. I personally decided to make an immediate tour of the region to gauge the forces available and find out first hand about the prevailing mood. Generally my impression was this: everywhere there was enormous interest on the part of the masses. Everywhere people were quite ready to go with us. I didn’t notice any romantic-utopian elements, perhaps because I was scarcely free of such inclinations myself... One provincial woman worker made a strong impression on me. According to her, if we did not issue new slogans, if we did not make the transition to a higher stage of the struggle, then the masses would lose faith in us and the verbal war with social-democratism would be superfluous; for the masses would sit on their hands. Failure to attend to this matter would result in demoralization to the greatest degree. Dissatisfaction and a decline in morale were noticeable. Everywhere I found the same “breakdown” resulting from the disparity between our military preparedness and the real situation. Upon my return to Białystok I gave a sober assessment of our possibilities; in other words, I had no reason to reproach myself for sowing illusions. First, before getting directly involved in the work, I had to go to Warsaw on urgent business. As was well known, the butcher Skalon10, governor-general of Warsaw, had shot 13 anarchists after unbelievable tortures. Our group decided to “eliminate” Skalon. The PPS11 was also after Skalon. We had reason to think that we would get to him first. After arranging for all the preparatory work, including keeping a close eye on the counter-revolution which was planning something, and trying to strengthen and broaden our contacts with rank-and-file soldiers, I considered it necessary to go to Warsaw for a short period. It was expected that I would negotiate with a representative of the combat organization of the PPS. I was supplied with the necessary recommendations. In Warsaw I set myself up splendidly in a conspiratorial sense. I posed as the buyer of a large quantity of paper for a print shop, and I slept in the common room with merchants in a completely legal “home”. The landlord was a staunch Black Hundreds type12 [chernosotenets] who was on good terms with the police who believed he had only his own kind staying there. My recommendation was effective and the landlord was delighted to talk to me about the abominable revolution. Soon my meeting with the representative of the PPS took place. Suddenly a newspaper boy appeared... He yelled: “Bloody pogrom in Białystok!... Thousands of victims!...” I bought a newspaper. Everything was clear. We had anticipated the reaction. And they had penetrated into Białystok? But that was impossible. Dark days were upon us. We had failed to transition the movement to a higher state of development. Clouds were gathering. And not only over Białystok. Over the whole revolution. But how?... There was no way out. We had to find it. Biloye, 1924, No. 27/28, pp. 172-182. Translated from Russian. Notes by the translator, who would like to thank NR for helpful suggestions. 1. "Thoughts about the Past" was a regular section in the journal Biloye where this article appeared. 2. 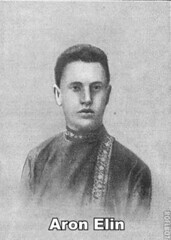 Leonid Semenovich Wilensky (1880-1950) was a Russian social-democrat from 1899, then a Bolshevik, then an anarchist from 1905. Later he became a communist and after 1917 was involved in Soviet work. 3. The basic units of the organized working class of Białystok in the early 20th century were "federations" which were the equivalent of trade union locals or syndicates. 4. Founded in 1897, the General Jewish Labour Bund in Russia and Poland sought to unite all Jewish workers in the Russian Empire into a united socialist party. 5. The narodovtsi were members of the National-Democratic Party, founded in 1897, which represented the Polish bourgeoisie. Originally calling for Polish independence, the party reacted to the rise of the workers’ movement by abandoning its demand for independence and becoming increasingly conservative, clerical, and antisemitic. 6. Eduard von der Ropp (1851-1939), from an aristocratic family, was the Roman Catholic bishop of Vilnius. 7. A regional newspaper which published left-wing viewpoints. In 1905 an independent (non-governmental), legal press was an innovation in the Russian empire. 8. Yuliy Osipovich Martov (1873-1923) and Vera Ivanovna Zasulich (1849-1919) were leaders of the Menshevik wing of the Russian Social Democratic Party. 9. "Oh no - I have made a business of blood. ... I will take up my trade again. I will watch and spy day after day, one weary hour after another. I will live by death, and a day will come with its intoxicating joy : I will have accomplished my purpose - scored a victory. And such will be my life until I go to the gallows, until I go into my grave." from the novel Kon' Bledniy [The Pale Horse] (1909) by Ropshin [penname of the revolutionary terrorist Boris Savinkov (1879-1925)]. 10. Georgiy Antonovich Skalon (1847-1914), a cavalry general in the Russian Army, was governor-general of Poland in 1905-1914. 11. The Polish Socialist Party (founded 1892), an illegal party in the Russian empire, was more nationalist than socialist. 12. The Black Hundreds were a right-wing political formation which emerged in the Russian empire during the 1905 revolution to defend the autocracy. Very interesting. My Father's family was from a "shettl" (small village) somewhere outside of Bialystock. No one seems to have remembered the name, with everyone now long gone. For those mavens of bread the "bialy" (sort of a bagel---ok Brits, biegel-- without a hole) origins are from this city. Ah, a person who knows their bread! True enough to the extent that in the center of the bialy (here in NYC) there's onoon, sometimes garlic...and the dough is much softer then a biegel.